On Jan. 22, FireEye participated in a panel focused on cryptocurrencies and blockchain technology during the World Economic Forum. The panel addressed issues raised in a report developed by FireEye, together with our partner Marsh & McLennan (a global professional services firm) and Circle (a global crypto finance company). The report touched on some of the security considerations around crypto-assets today and in the future, and in this blog post, we delve deeper into the security paradigms surrounding cryptocurrencies and blockchain networks. First, some background that will provide context for this discussion. By its simplest definition, cryptocurrency is digital money that operates on its own decentralized transaction network. When defined holistically, many argue that cryptocurrencies and their distributed ledger (blockchain) technology is powerful enough to radically change the basic economic pillars of society and fundamentally alter the way our systems of trust, governance, trade, ownership, and business function. However, the technology is new, subject to change, and certain headwinds related to scalability and security still need to be navigated. It is safe to assume that the ecosystem we have today will evolve. Since the final ecosystem is yet to be determined, as new technology develops and grows in user adoption, the associated risk areas will continually shift creating new cyber security paradigms for all network users to consider, whether you are an individual user of cryptocurrency, a miner, a service-provider (e.g., exchange, trading platform, or key custodian), a regulator, or a nation-state with vested political interest. Malicious actors employ a wide variety of tactics to steal cryptocurrencies. These efforts can target users and their wallets, exchanges and/or key custodial services, and underlying networks or protocols supporting cryptocurrencies. 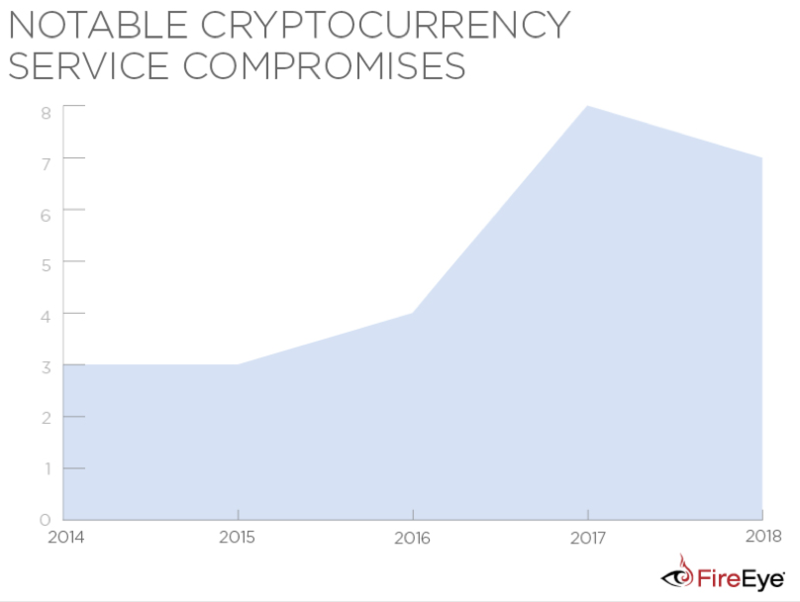 FireEye has observed successful attacks that steal from users and cryptocurrency exchanges over the past several years. And while less frequent, attacks targeting cryptocurrency networks and protocols have also been observed. We believe cryptocurrency exchanges and/or key custodial services are, and will continue to be, attractive targets for malicious operations due to the potentially large profits, their often-lax physical and network security, and the lack of regulation and oversight. This blog post will highlight some of the various risk areas to consider when developing and adopting cryptocurrency and blockchain technology. There are two types of keys associated with each wallet: a public key and a private key. Each of these keys provides a different function, and it is the security of the private key that is paramount to securing cryptocurrency funds. The private key is a randomly generated number used to sign transactions and spend funds within a specific wallet, and the public key (which is derived from the private key) is used to generate a wallet address to which they can receive funds. The private key must be kept secret at all times and, unfortunately, revealing it to third-parties (or allowing third-parties to manage and store private keys) increases convenience at the expense of security. In fact, some of the most high-profile exchange breaches have occurred in large part due to a lack of operational controls relating to the storage of private keys. Maintaining the confidentiality, integrity, and availability of private keys requires fairly robust controls. By definition, cryptocurrency wallets are used to store a users keys, which can be used to unlock access to the funds residing in the associated blockchain entry (address). Several types of wallets exist, each with their own level of security (pros) and associated risks (cons). Generally, wallets fall into two categories: hot (online) and cold (offline). A wallet stored on a general computing device connected to the internet is often referred to as a hot wallet. This type of storage presents the largest attack surface and is, consequently, the riskiest way to store private keys. Types of hot wallets typically include user-controlled and locally stored wallets (also referred to as desktop wallets), mobile wallets, and web wallets. If remote access on any hot wallet device occurs, the risk of theft greatly increases. As stated, many of these solutions store private keys in a well-known and/or unencrypted location, which can make for an attractive target for bad actors. While many of these wallet types offer the user high levels of convenience, security is often the trade-off. Use two-factor authentication when available (as well as fingerprint authentication where applicable). Ensure that your private keys are stored encrypted (if possible). Consider using an alternative or secondary device to access funds (like a secondary mobile device or computer not generally used every day) and kept offline when not in use. Offline, also called cold wallets, are those that generate and store private keys offline on an air-gapped computer without network interfaces or connections to the outside internet. Cold wallets work by taking the unsigned transactions that occur online, transferring those transactions offline to be verified and signed, and then pushing the transactions back online to be broadcasted onto the Bitcoin network. Managing private keys in this way is considered to be more secure against threats such as hackers and malware. These types of offline vaults used for storing private keys is becoming the industry security standard for key custodians such as Coinbase, Bittrex, and other centralized cryptocurrency companies. Even recently, Fidelity Investments released a statement regarding their intentions to play an integral part of the Bitcoins custodial infrastructure landscape. "Fidelity Digital Assets will provide a secure, compliant, and institutional-grade omnibus storage solution for bitcoin, ether and other digital assets. This consists of vaulted cold storage, multi-level physical and cyber controls security protocols that have been created leveraging Fidelitys time-tested security principles and best practices combined with internal and external digital asset experts." In addition to those four types of attacks, WikiLeaks revealed, as part of its ongoing Vault 7 leak, a tool suite (dubbed Brutal Kangaroo, formerly EZCheese) allegedly used by the CIA for targeting air-gapped networks. PowerHammer, a malware that leverages power lines to exfiltrate data from air-gapped computers. Hardware wallets are typically a small peripheral device (such as USB drives) used to generate and store keys, as well as verify and sign transactions. The device signs the transactions internally and only transmits the signed transactions to the network when connected to a networked computer. It is this separation of the private keys from the vulnerable online environment that allows a user to transact on the blockchain with reduced risk. However, hardware wallets are susceptible to exploitation as well, such as man-in-the-middle (MitM) supply chain attacks, wherein a compromised device is purchased. 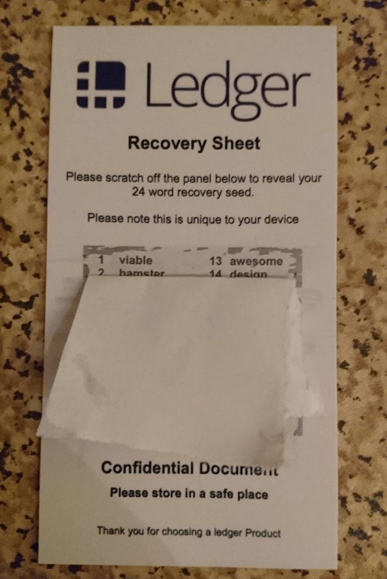 Such an event obstenibly occurred in early 2018, when an individual purchased a compromised Nano Ledger off of eBay, and consequently lost $34,000 USD worth of cryptocurrency stored on the device as the attacker created their own recovery seed to later retrieve the funds stored on the device. In order to trick the victim, the attacker included a fake recovery seed form inside the compromised device packaging (as seen in Figure 2). To help mitigate the risk of such an attack, FireEye recommends only purchasing a hardware wallet from the manufacturer directly or through authorized resellers. In addition to supply-chain attacks, security researchers with Wallet.fail have recently disclosed two vulnerabilities in the Ledger Nano S device. One of these vulnerabilities allows an attacker to execute arbitrary code from the boot menu, and the other allows physical manipulation without the user knowing due to a lack of tamper evidence. In both cases, physical access to the device is required, and thus deemed less likely to occur if proper physical security of the device is maintained and unauthorized third-party purchasing is avoided. Typically, wallet software solutions hide the process of generating, using, and storing private keys from the user. However, a paper wallet involves using an open-source wallet generator like BitAddress[. ]org and WalletGenerator[. ]net to generate the users public and private keys. Those keys are then printed to a piece of paper. While many view this form of key management as more secure because the keys do not reside on a digital device, there are still risks. Because the private key is printed on paper, theft, loss, and physical damage present the highest risk to the user. Paper wallets are one of the only forms of key management that outwardly display the private key in such a way and should be used with extreme caution. It is also known that many printers keep a cache of printed content, so the possibility of extracting printed keys from exploited printers should also be considered. According to recent Cambridge University research, in 2013 there were approximately 300,000 to 1.3 million users of cryptocurrency. By 2017 there were between 2.9 million and 5.8 million users. To facilitate this expedited user growth, a multitude of companies have materialized that offer services enabling user interaction with the various cryptocurrency networks. A majority of these businesses function as an exchange and/or key custodians. Consequently, this can make the organization an ideal candidate for intrusion activity, whether it be spear phishing, distributed denial of service (DDoS) attacks, ransomware, or extortion threats (from both internal and external sources). Many cryptocurrency exchanges and services around the world have reportedly suffered breaches and thefts in recent years that resulted in substantial financial losses and, in many cases, closures (Figure 3). One 2013 study found that out of 40 bitcoin exchanges analyzed, over 22 percent had experienced security breaches, forcing 56 percent of affected exchanges to go out of business. Bancor admitted that unidentified actors compromised a wallet that was used to upgrade smart contracts. The actors purportedly withdrew 24,984 ETH tokens ($12.5 million USD) and 229,356,645 NPXS (Pundi X) tokens (approximately $1 million USD). The hackers also stole 3,200,000 of Bancor's own BNT tokens (approximately $10 million USD). Bancor did not comment on the details of the compromise or security measures it planned to introduce. Attackers stole cryptocurrencies worth $30 million USD from South Korea's largest cryptocurrency exchange, Bithumb. According to Cointelegraph Japan, the attackers hijacked Bithumb's hot (online) wallet. Coinrail admitted there was a "cyber intrusion" in its system and an estimated 40 billion won ($37.2 million USD) worth of coins were stolen. Police are investigating the breach, but no further details were released. BitGrail claimed $195 million USD worth of customers' cryptocurrency in Nano (XRB) was stolen. Unidentified attackers stole 523 million NEM coins (approximately $534 million USD) from the exchange's hot wallet. Coincheck stated that NEM coins were kept on a single-signature hot wallet rather than a more secure multi-signature wallet and confirmed that stolen coins belonged to Coincheck customers. Unidentified actors reportedly stole $7.4 million USD from users attempting to invest during a Coindash (app platform) ICO. Coindash, which offers a trading platform for ether, launched its ICO by posting an Ethereum address to which potential investors could send funds. However, malicious actors compromised the website and replaced the legitimate address with their own ether wallet address. Coindash realized the manipulation and warned users only three minutes after the ICO began, but multiple individuals had already sent funds to the wrong wallet. This incident was the first known compromise of an ICO, which indicates the persistent creativity of malicious actors in targeting cryptocurrencies. Bithumb, a large exchange for ether and bitcoin, admitted that malicious actors stole a user database from a computer of an employee that allegedly includes the names, email addresses, and phone numbers of more than 31,800 customers. Bithumb stated that its internal network was not compromised. Bithumb suggested that actors behind this compromise used the stolen data to conduct phishing operations against the exchange's users in an attempt to steal currency from its wallets, allegedly stealing cryptocurrency worth more than $1 million USD. Unidentified actor(s) reportedly compromised four hot wallets belonging to a South Korean Bitcoin exchange, Yapizon, and stole more than 3,816 bitcoins (approximately $5 million USD). The identity of the responsible actor(s) and the method used to access the wallets remain unknown. However, Yapizon stated that there was no insider involvement in this incident. Malicious actor(s) stole almost 120,000 bitcoins ($72 million USD at the time), from clients' accounts at Bitfinex, an exchange platform in Hong Kong. How the breach occurred remains unknown, but the exchange made some changes to its systems after regulatory scrutiny. However, some speculate that complying with the regulators' recommendations made Bitfinex vulnerable to theft. The Hong Kong-based Gatecoin announced that as much as $2 million USD in ether and bitcoin were lost following an attack that occurred over multiple days. The company claimed that a malicious actor altered its system so ether deposit transfers went directly to the attacker's wallet during the breach. The Chinese exchange KipCoin announced that an attacker gained access to its server in 2014 and downloaded the wallet.dat file. The malicious actor stole more than 3,000 bitcoins months later. BTER announced via its website that it lost 7,170 bitcoins, ($1.75 million USD at the time). The company claimed that the bitcoins were stolen from its cold wallet. Bitstamp reported that multiple operational wallets were compromised, which resulted in the loss of 19,000 bitcoins. The company received multiple phishing attempts in the months prior to the theft. One employee allegedly downloaded a malicious file that gave the attacker access to servers that contained the wallet.dat file and passphrase for the company's hot wallet. The China-based exchange BTER claimed that an attacker stole 50 million NXT, ($1.65 million USD at the time). The company claims the theft was possible following an attack on one of its hosting servers. The company reportedly negotiated the return of 85 percent of the stolen funds from the attacker. MintPal admitted that an attacker accessed 8 million VeriCoins ($1.8 million USD) in the company's hot wallet. The attackers exploited a vulnerability in its withdrawal system that allowed them to bypass security controls to withdraw the funds. Mt. Gox, one of the largest cryptocurrency exchanges, filed for bankruptcy following a theft of 850,000 bitcoins (approximately $450 million USD at the time) and more than $24 million USD from its bank accounts. A bug in the exchange's system that went unidentified for years allegedly enabled this compromise. Additionally, some speculated that an insider could have conducted the theft. Notably, recent reports revolving around the arrest of the founder of BTC-e (Alexander Vinnik) suggest he was responsible for the attack on Mt. Gox. As little oversight is established for cryptocurrency exchanges and no widely accepted security standards exist for them, such incidents will likely persist. Notably, while these incidents may involve outsiders compromising exchanges' and services' systems, many of the high-profile compromises have also sparked speculations that insiders have been involved. While there has yet to be an in-the-wild attack that has caused significant harm to the Bitcoin network itself, remember the Bitcoin software is just that: software. Developers have identified 30 common vulnerabilities and exposures (CVEs) since at least 2010, many of which could have caused denial of service attacks on the network, exposure of user information, degradation of transaction integrity, or theft of funds. The most recent software bug was a transaction validation bug that affected the consensus rules; essentially allowing miners to create transactions that werent properly validated and contained an extra input which could have ultimately been exploited to create an amount of bitcoin from nothing. This vulnerability went unnoticed for two years, and fortunately was responsibly disclosed. Running any peer-to-peer (P2P) or decentralized and distributed software is risky because each individual user has the responsibility to upgrade software when bugs are found. The more people who fail to update their software in a timely manner, the greater the chance of those nodes being exploited or used to attack the network. One proposed suggestion is to increase the block size, which consequently shifts the cost of scaling to miners and those who operate nodes. Some argue that this could introduce the risk of centralization, because the only larger organizations that can meet the bandwidth and storage demands of ever-increasing block sizes can support this type of solution. Some of the more popular blockchain scaling solutions for crypto-assets often depend on layering networks and system architectures on top of the base protocol also referred to as layer two (L2) scaling. This allows users to conduct transactions off-chain and only occasionally synchronize them with the Bitcoin blockchain. Many argue that this is similar to how legal contracts are enforced; you dont need to go to court each time a legal contract is written, agreed upon, and executed. And this is something that already occurs frequently in Bitcoin, as the vast majority of transactions happen offline and off-chain within large exchanges and merchant providers cold storage solutions. This solution involves pushing transactions off-chain to a privately managed database where transaction can be settled and then occasionally synced with the Bitcoin blockchain. However, in creating this second layer of private off-chain transaction processing, an element of trust is introduced to the system, which unfortunately introduces risk. When transactions occur off-chain in a centralized private database, there is risk of improperly secured centralized ledgers that can be falsified or targeted for attack. Another L2 solution would be to push transactions off-chain not onto a private database, but to a trustless decentralized routing network. There are two primary L2 solutions being developed: The Liquid Network (for Bitcoin) and Raiden (for Ethereum). However, a critique of this type of scaling solution is that the accounts used on this layer are considered hot wallets, which presents the largest attack surface. This makes it the riskiest way to store funds while also creating a valuable target for hackers. If an attacker is able to identify and access a users L2 node and associated wallet, they could transmit all funds out of the users wallet. Lightning and Raiden as scaling solutions are still relatively new and experimental, so its unknown whether the they will be globally accepted as the preferred industry scaling solution. Additionally, because this layered development is still new and not widely implemented, at the time of this post there has not yet been an instance or proof of concept attack against L2 networks. In early April 2018, the cryptocurrency Verge reportedly suffered a 51% attack, which resulted in the attacker being able to mine 1,560 Verge coins (XVG) every second for a duration of three hours. In May 2018, developers notified various cryptocurrency exchanges of a 51% attack on Bitcoin Gold. According to a report by Bitcoinist, the attack cost exchanges nearly $18 million. Following the Bitcoin Gold attack, in June 2018, ZenCash became another target of the 51% attack, in which attackers siphoned $550,000 USD worth of currency from exchanges. Companies such asNiceHash offer a marketplace for cryptocurrency cloud mining in which individuals can rent hashing power. Couple the information available from sites like Crypto51, which calculates the cost of performing 51% attacks, and it presents an attractive option for criminals seeking to disrupt cryptocurrency networks. While these types of attacks have been observed, and are no longer theoretical, they have historically posed the most risk to various alt-coins with lower network participation and hash rate. Larger, more robust, proof-of-work (PoW) networks are less likely to be affected, as the cost to perform the attack outweighs potential profit. We anticipate that as long as the cost to perform the 51% attack and the likelihood of getting caught remains low, while the potential profit remains high, actors will continue showing interest in these types of attacks across less-robust cryptocurrency networks. A Sybil attack occurs when a single node claims to be multiple nodes on the P2P network, which many see as one of the greatest security risks among all large-scale, peer-to-peer networks. A notable Sybil attack (in conjunction with a traffic confirmation attack) against the Tor anonymity network occurred in 2014, spanned the course of five months, and was conducted by unknown actors. Block honest users from the network by outnumber honest nodes on the network, and refusing to receive or transmit blocks. Change the order of transactions, prevent them from being confirmed, or even reverse transactions that can lead to double spending by controlling a majority of the network computing power in large-scale attacks. As described by Microsoft researcher John Douceur, many P2P networks rely on redundancy to help lower the dependence on potential hostile nodes and reduce the risk of such attacks. However, this method of mitigation falls short if an attacker impersonates a substantial fraction of the network nodes, rendering redundancy efforts moot. The suggested solution to avoiding Sybil attacks in P2P networks, as presented in the research, is to implement a logically centralized authority that can perform node identity/verification. According to the research, without implementing such a solution, Sybil attacks will always remain a threat except under extreme and unrealistic assumptions of resource parity and coordination among entities. Engineered Block Races:Block races occur in mining when two miners discover blocks at the same time. Generally, one block will be added to the chain, yielding mining rewards, while the other block is orphaned and ignored, yielding no mining reward. If an attacker can successfully eclipse attack miners, the attacker can engineer block races by hoarding blocks until a competing block has been found by non-eclipsed miners effectively causing the eclipsed miners to waste efforts on orphaned blocks. Splitting Mining Power: An attacker could use eclipse attacks to effectively cordon off fractions of miners on a network, thereby eliminating their hashing power from the network. Removing hashing power from a network allows for easier 51% attacks to occur given enough miners are effectively segmented from the network to make a 51% attack profitable. On Jan. 5, 2019, the cryptocurrency company Coinbase detected a possible eclipse + 51% attack effecting the Ethereum Classic (ETC) blockchain. The attack involved malicious nodes surrounding Coinbase nodes, presenting them with several deep chain reorganizations and multiple double spends totaling 219,500 ETC (worth at the time of this reporting roughly $1.1 million USD). Randomized node selection when establishing connections. Retain information on other nodes previously deemed honest, and implement preferential connection to those nodes prior to randomized connections (this increases the likelihood of connecting to at least one honest node). Because of the public sectors wait-and-see approach to regulation, it could be argued that the private sector should have a more active role in securing the technology as it continues to mature. Private sector leaders in software and network development, hardware manufacturing, and cyber security all have the ability to weigh in on blockchain development as it progresses to ensure user security and privacy are top priorities. Universities and independent research groups should continue to study this emerging technology as it develops. While no widely promoted and formal security standards exist for cryptocurrency networks at the time of this post, The Cryptocurrency Certification Consortium (C4) is actively developing the Cryptocurrency Security Standard (CCSS), a set of requirements and framework to complement existing information security standards as it relates to cryptocurrencies, including exchanges, web applications, and cryptocurrency storage solutions. Forced encryption of locally stored wallet files (instead of opt-in options). Code or policy rule that requires new wallet and key generation when user performs password changes. Continued development and security hardening of multi-sig wallet solutions. Emphasis on and clear guidelines for responsible bug disclosure. Continued security research and public reporting on security implications of both known and hypothetical vulnerabilities regarding blockchain development. Analyzing protocols and implementations to determine what threats they face, and providing guidance on best practices. While blockchain technology offers the promise of enhanced security, it also presents its own challenges. Greater responsibility for security is often put into the hands of the individual user, and while some of the security challenges facing exchanges and online wallet providers can be addressed through existing best practices in cyber security, linking multiple users, software solutions, and integration into complex legacy financial systems creates several new cyber security paradigms. To maintain strong network security, the roles and responsibilities of each type of participant in a blockchain network must be clearly defined and enforced, and the cyber security risks posed by each type of participant must be identified and managed. It is also critical that blockchain development teams understand the full range of potential threats that arise from interoperating with third parties and layering protocols and applications atop the base protocols. The value and popularity of cryptocurrencies has grown significantly in the recent years, making these types of currencies a very attractive target for financially motivated actors. Many of the aforementioned examples of the various attack vectors can be of high utility in financially motivated operations. We expect cyber crime actors will continue to demonstrate high interest in targeting cryptocurrencies and their underlying network protocols for the foreseeable future.